BrinNutz's donut was wonderful, a real breakthrough. But it had a very slight fermented-type off note for me and was a little nutty. 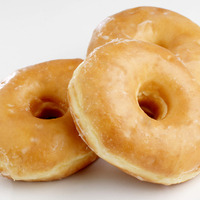 Reducing %'s got rid of that stale-beerish flavor and left behind only a mouthwatering plain glazed donut. Derived from The Glazed Doughnut by BrinNutz by BrinNutz. This juice has been steeping for 4 weeks on my shelf and I don't know what to say, the only thing it tastes of is yeast. I couldn't vape it and I'm sorry about that because I was very much looking forward to it. total props for taking a shot at the perfect PLAIN glazed doughnut, one that is unafraid to hide behind chocolate/fruit/etc. while i think the level of joy might be correct for the actual vapor produced by this juice, it's too much for me when it condenses and hits my tongue in liquid form. i can mostly escape it, but as soon as i get a fleck of spitback or condensation, the mild yeastiness explodes on my palate, which is unpleasant and takes me out of the moment.